Major chain restaurants are rarely my favorite places to go out to dinner. Often the food is unoriginal and not very interesting. But getting to know if a chain restaurant can take care of my gluten-free needs safely is absolutely invaluable. Chain restaurants have the advantage of being readily available in many locations and usually use common recipes and methods of food preparation across the entire chain. If I am familiar with a chain restaurant and know that it can feed me safely, then I have fewer problems and I have more options available to me when away from home. Red Lobster is definitely a chain restaurant and has many, many locations. So, when my daughter requested we go there for her birthday dinner, I didn't groan too loudly. I wanted to find out if they could feed me safely. This was my daughter's choice. I think she had been talking to her friends about various kinds of seafood. I'll bet one of her friends mentioned the restaurant. I'll bet that's what inspired the request. And this is what she ordered. It was a combination plate and what definitely not exclusively gluten-free. See those battered and fried shrimp? Yep, not gluten-free. But that's okay, since she doesn't need to be gluten-free. She didn't actually expect to eat all this seafood herself. She really just wanted to sample lots of different kinds of seafood. So, I offered to help (ha!) her, if she could just substitute a form of lobster that would be gluten-free. The lobster variety included in the combination plate was not gluten-free. How do I know this? Well, in spite of not having a gluten-free menu, the restaurant did have a binder with printouts of all the menu items and their allergens. From this, I was able to identify a style of lobster that was gluten-free. We just asked our waitress to substitute the gluten-free variety for the variety in the combination. No problem. The crab legs were already gluten-free. For myself, I ordered a gluten-free salad, of course. 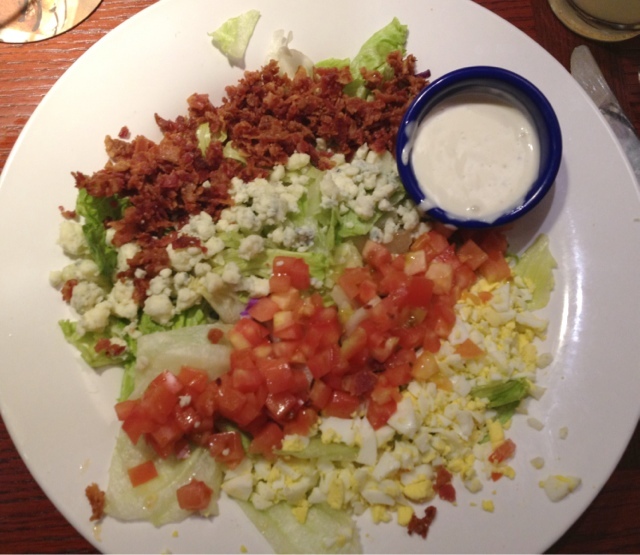 The blue cheese dressing was gluten-free. I did eat safely here. That is good news! But I must also admit that it was not a fabulous dining experience. The restaurant was very noisy, the waitress slow, the salad boring. Well, my daughter was happy to have gotten her huge plate of different kinds of seafood. She enjoyed it. What I tasted of it was just okay. If I were looking for a good, not even great, seafood dinner, I would choose somewhere else. ...but Red Lobster did prepare gluten-free food for me that was safe. I did not get sick. I did get to eat seafood. I did get to share a nice dinner with my family and my daughter on her birthday. That is the true value of this safe dinner. 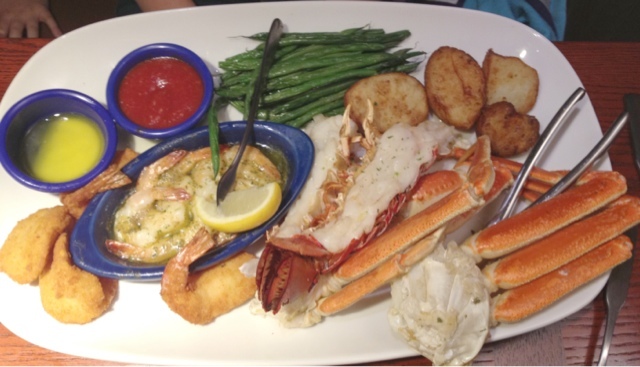 Red Lobster fed me gluten-free and I was able to enjoy a birthday dinner out with my family. Now, I have one more option available to me when I travel. Or when there is a request from a family member.